Indigo and Kiara after receiving the 800m silver and gold medals. 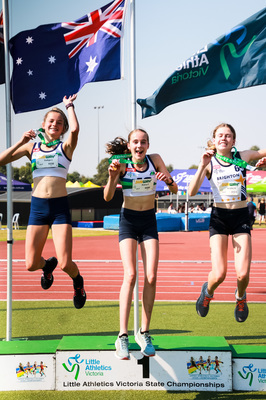 Nineteen of the most talented athletes in the Yarra Ranges represented Yarra Ranges Athletics at the State Little athletics track and field Championships at Casey Fields on the weekend. Joining them were the best U9 –U16 athletes in Victoria for 2 days of fun and exciting athletics action. The Yarra Ranges Athletics team recorded untold personal bests, while a lucky few managed to win a medal or two. Emily Fiedler showed her potential with 2 golds and a silver from the weekend. Other medals went to Kiara Flavel, Indigo Linde, Zoe Clarke and Summer Caldicott.